An expert provides a multimodal approach to help manage your osteoarthritis cases. 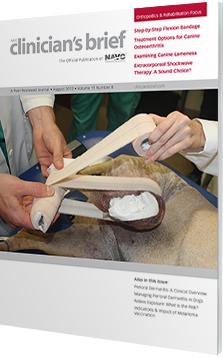 Plus, use an algorithm to help localize the cause of lameness in canine patients, and learn how to decrease the occurrence of quadriceps contracture with the 90-90 flexion bandage. Offering Options to Clients: Good or Bad Idea? 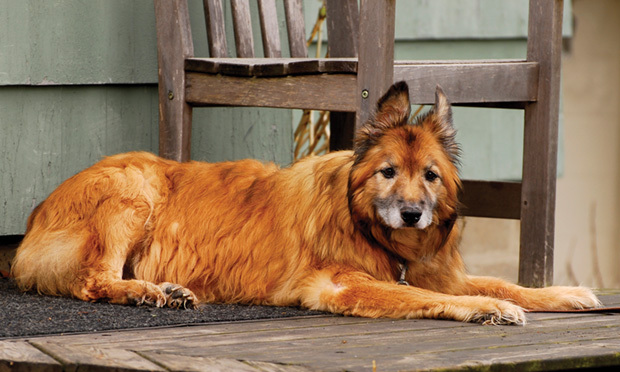 Should veterinarians offer options to clients, or does it create confusion? Two experts debate. 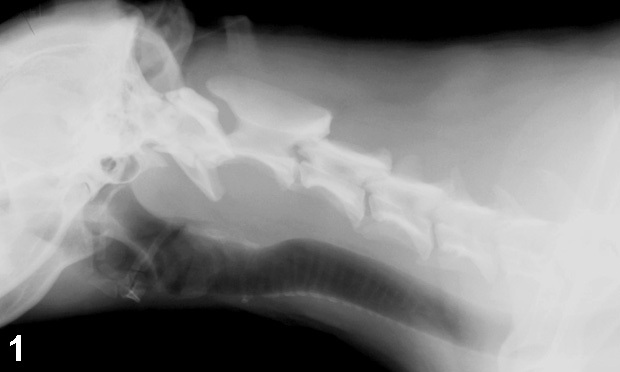 A 3-year-old spayed female German shepherd presented for 6-months of progressive, intermittent respiratory noise. When following open stabilization of femoral fractures, the 90-90 flexion bandage may decrease the occurrence of quadriceps contracture. 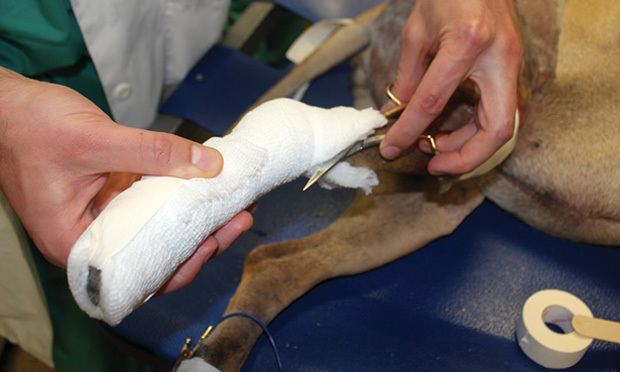 A complete history and thorough orthopedic examination (including specific techniques) can help localize the lameness and determine further diagnostics. 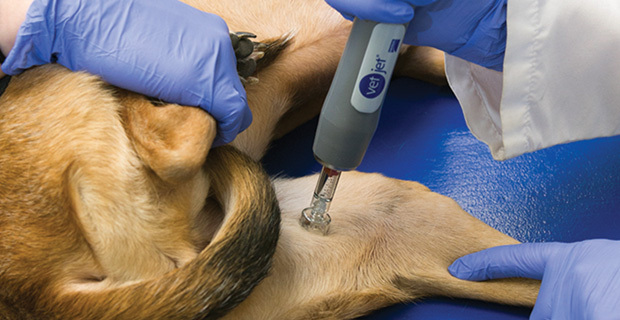 The canine melanoma vaccine appears to be safe and effective when used conjunctively with other therapies, making knowledge of this novel treatment’s advantages and disadvantages important. 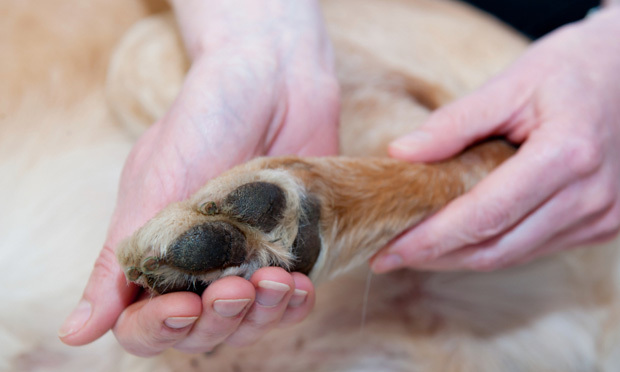 Evaluating lameness and radiographs allow for diagnosis of canine osteoarthritis, and tailoring treatment to remove underlying joint pathology is critical for success. 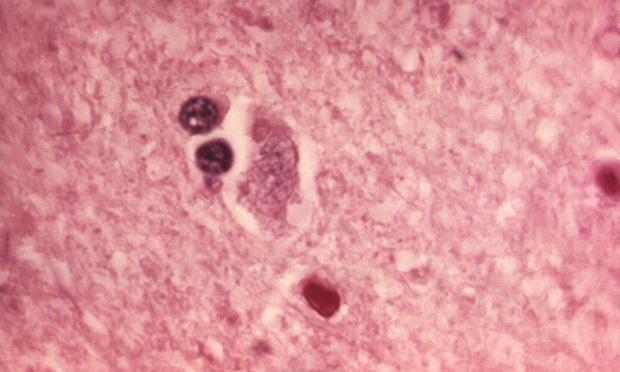 A dog with no vaccination history bit a veterinary technician, who became concerned about potential risk for rabies. How should the potential exposure be addressed? 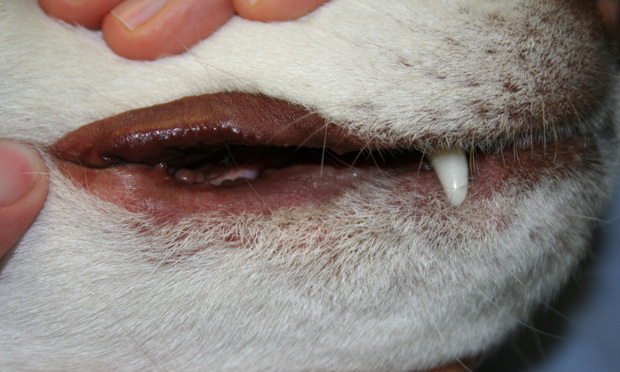 Understanding potential causes, clinical signs, and types of infections is crucial when diagnosing and treating canine perioral dermatitis. Perioral dermatitis stems from a wide range of causes. 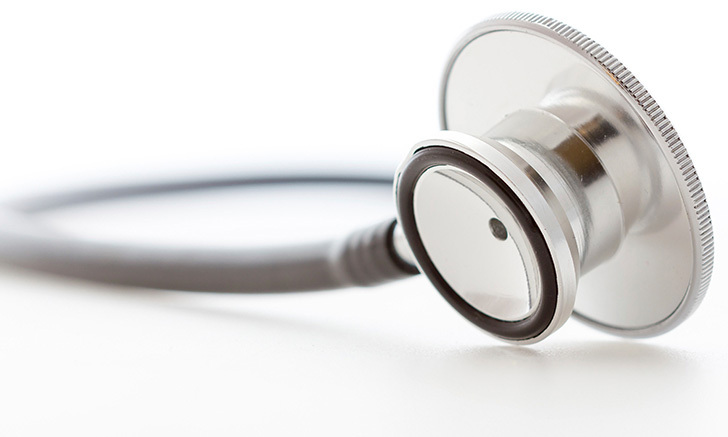 Narrow the diagnostic differentials with straight-forward questions. 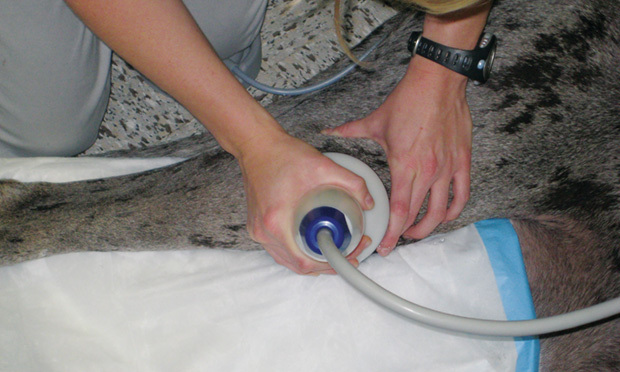 As part of physical rehabilitation, extracorporeal shockwave therapy may support bone, tendon and ligament healing; osteoarthritis treatment; and healing of chronic wounds. Two dogs ingest 3 pounds of snail bait. One dies; the other exhibits mild tremors and suffers a seizure after initial treatment. What went wrong? In this exclusive video, Dr. Howard Seim demonstrates a technique for performing forelimb amputation. Dental Radiographs: Key to a More Accurate Diagnosis? Is Free Tissue Transfer Worth the Effort? 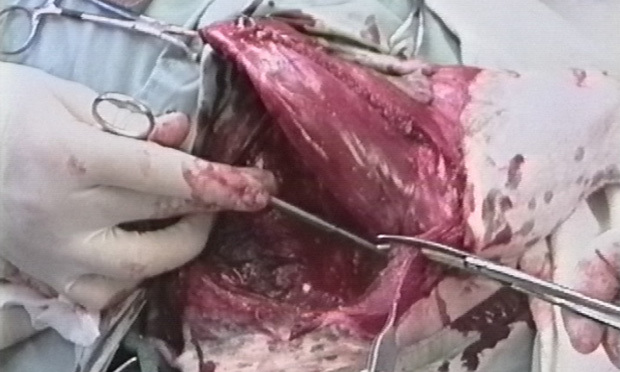 Is Surgery Best for Diaphragmatic Hernia?